Sorry, I forgot to tell that with the midi library you can build entire banks, just create a bank and copy the snapshots to it. You have to do it by keyboard or by copy+paste, drag n drop doesn’t works here. Adjust the midi message timing to avoid overloads in your machine. It will take some more time but the transmission will be safer. How do you do with Lua to send midi presets? Is there any prefab to use as an example? He, he… Well, you must set it to 1425 as this seem to be the number of parameters the SY77 has. To get all those VST parameters working you need to copy the file Ctrlr_xxx.overrides existing in the installation folder to the same Folder the vst DLL is. The name must be the same the DLL has. Edit with notepad and set maxvstparams (or something like that) to the value you prefer although the predefined 512 use to be enough for any machine. 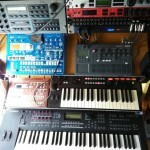 For some Roland and Yamaha you’ll need 1000 parameters or more. Oh, and sorry for my bad English. I’ve fixed some of them. If anyone wants to generate a lua script to translate presets, feel free to modify anything an repost here, thanks. The file contains the old and the new version “K4R b”. Remember to use the overrides to allow full VST automation. This reply was modified 3 years, 1 month ago by wikter. It’s interesting… and that’s a pretty cheap piece of hardware. Maybe it’d be “resizable” to the SY22/TG33, taking away filters and adapting messages. Buzz sequences patterns ad eases a lot FX testing, allows multichannel connection, midi CC assign and some other basic operations. …and just to post something about negative values. The midi data values NEVER go beyond 7F. It’s a fault, a leak, a failure, an ERROR to see FF as data. Midi specs lock 80-FF values for control. Just to state that Ctrlr don’t do the job. It’s full of NRPN’s… avoid automating more than one parameter at the same time. Or modify it by yourself and post it here… No copyrights here. Thanks anyway. That’s sysex, no channel here, isn’t it?. Maybe Sysex Id? Am I wrong? Well, the solution is forget about the USB midi input, the usb output is fast and works nice. And the keyboard output should be connected to a Midi port and problems stop. Look for documentation outside this site. LUA is extended and explained in other webpages. It is not Ctrlr exclusive. Just open a sample ensemble and take a look at the edit mode. It,s really easy to understand how cc’s or sysex are sent. Seems very complex but is just like a mixer console, once you’re done to one channel, doesn’t care how many.